The Capstone Strategy Project, one of the hallmarks of Vanderbilt’s program, allows you to put everything you’ve learned to the test as you work with your Capstone Team on a significant organizational challenge or opportunity. With faculty support and the resources of the world-class management library, your team has everything it needs to succeed. It takes many managers, healthcare practitioners, and other executives to care for a patient and to manage a healthcare organization. Having the skills to manage a team, evaluate critical problems and execute solutions is required to be an effective business leader. 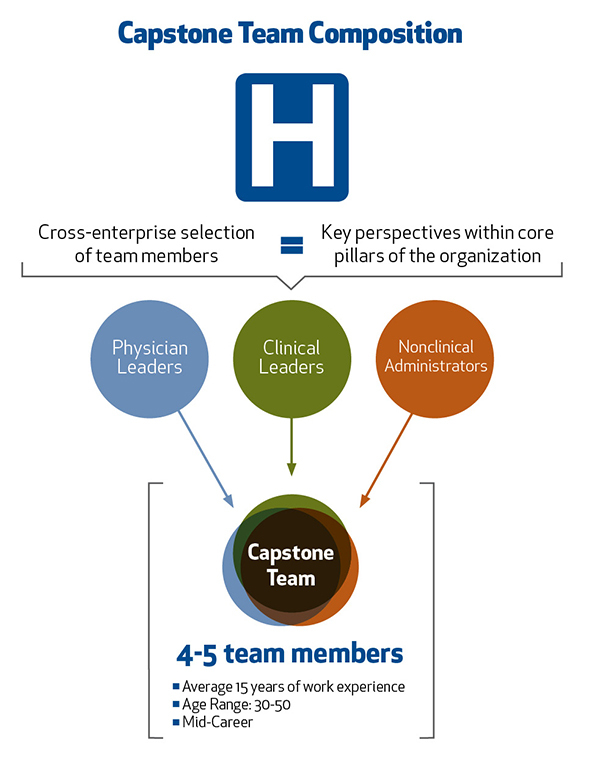 This is why your Capstone Team will be comprised of a cross-functional group of 4-5 executives, each with a diverse set of backgrounds and industry experiences, giving you an experience that emulates the work environment of a healthcare delivery organization. Support includes coaching on team dynamics and the progress of your work together, checkpoints to ensure you’re on track and guidance for projects that serve as a real-world learning lab. The Capstone Strategy Project complements the classroom instruction and is defined as learning by construction—a total immersion experience in which students are challenged to use all of the tools and concepts learned to date to tackle a current business problem for a healthcare organization. With faculty oversight, you demonstrate rigorous application of business concepts and disciplines. Leading a project of utmost importance for your organization provides immediate impact that benefits the student and the sponsoring organization. As the class makeup represents a very diverse talent pool within a healthcare organization, it promotes working outside of our comfort zones and valuing the skills and experiences of others. There is no doubt that the biggest thing I will miss after graduation is the weekly (and often several times weekly depending on team project deadlines) camaraderie experienced by the class. For the students, the Capstone Strategy Projects are opportunities to exhibit the healthcare business management knowledge you’ve acquired. You will demonstrate, to yourself and your organization, your ability to problem-solve creatively, make strategic decisions and manage as part of a high-level executive team. Learn More. For the organizations, the Capstone Strategy Projects are opportunities to have a team of experienced mid-level health care professionals conduct an intense engagement to address a current business need. Learn More.